Tis the season. The season for fresh veggies, straight from the garden, straight from the farmer's market, straight from a friendly neighbor or co-worker! I have waited for this this very time of year, ALL year for this reason! 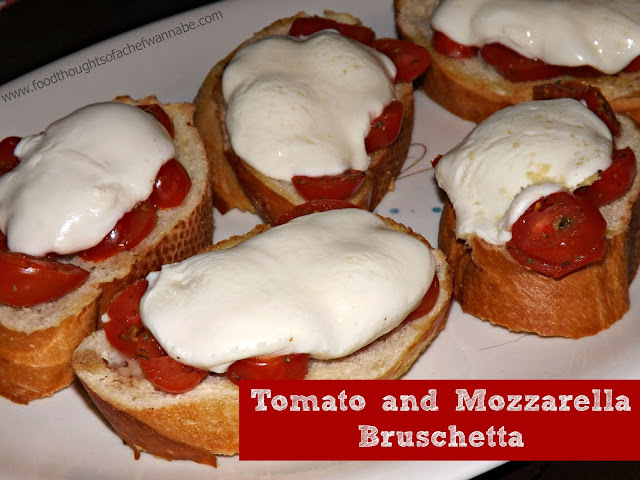 This very simple bruschetta, which you probably will notice isn't a traditional bruschetta, is one I have been making my family for years. We love this stuff and while I adore traditional bruschetta, this one, will probably blow you right outta your socks. As far as the tomatoes, I used cherry tomatoes, it is what I picked up at the farmers market but please feel free to use slices of tomato. I just think the cherry or grape that yu halve are easier to eat. For the cheese, there is no reason you can't use the shredded variety, but come on, take a look at this photos, do you see the thick winter coat of mozzarella on top? Nothing can beat that. I don't care for my mozz to be be browned on this particular dish but just a personal preference, feel free to let yours go until browned on top. Get a nice life of french bread or a baguette. Either one gets the job done. I used a large loaf, as I was serving these as a side dish. If you are using them for an appetizer, use a smaller loaf to accommodate your needs. Cut your bread in slices the thickness that you choose. (I made 8 of these but you could easily get 10 if you are doing the large slices like I did with this amount of tomatoes). Preheat your oven to 400. Lay your bread out on a baking sheet Now, drizzle each piece with a little olive oil, flip it and do it again. Do this with each piece. Sprinkle on some dried Italian seasoning, just go with your gut on this one, a little bit of salt and pepper, do NOT forget that part and place in the oven for 5-7 minutes, until golden and crusty! While that is happening, half your tomatoes and put them in bowl. Add a SMALL drizzle of olive oil, salt, and some Italian seasoning. This is all to taste friends. Mix to combine and let sit while bread finishes. Get your mozzarella sliced if using fresh and just feel the excitement in the air. My mouth is literally watering while I type. When the bread is done, top each one with the tomato mixture until it is all used. Lay a piece of mozz on the top and put back in the oven until the cheese is melted and/or browned to your desired taste. This is so good. Just so simple and so good. I hope you enjoy it as much as we do!